Before I begin my teaching on John, I have a plea to those who receive and are hopefully blessed by the revelation knowledge the Lord has so graciously given me. If you are taught and blessed by these teachings, I ask you to share them and my website with others. The only way these can reach the Body of Christ is if each one of you share them with others. Christ wants His Body to receive them first so they can teach it to others. This is how God's grace and truth are multiplied. My heart wants more than anything to see the Body of Christ matured and ready for His coming. The beauty of His Bride dressed in white will bring great joy and glory to Jesus. I have spent a lot of time showing you the harmony and agreement of the Older Testament and the New Testament -- that they are both a revelation of Jesus Christ. There is much more that I could teach you regarding this, but the Lord is telling me to teach on the Apostle John's writings. The word "love" is used in John's writings more than any other gospel. John's writings draw us closer to Jesus' heart and His Eternal Truth. In the paintings of the Lord's Supper, John is the one leaning over the Lord's heart . (John 21:20) John was a man after God's own heart like David in the Older Testament. John heard the heartbeat of God. John understood God's heart. He wanted to be connected to Jesus heart to heart in an intimate relationship. John drew close to Jesus and saw things more deeply. The closer we draw to someone, the more intense and intimate the love. In the "natural," a growing baby can hear the heartbeat of its mother. It is a steady rhythm of love and comfort to the child as he or she grows in her womb. The same is true in the "spiritual." We must know and hear the heartbeat of the love and comfort of God and Jesus as we grow spiritually. These three -- Father, Son/Word and Holy Spirit-- are in fullness in Christ. He had the fullness of Truth because He is the Truth-- the Living Word. He had the fullness of the Holy Spirit because He had no sin. So, when we believe in Jesus, we too have the Father, Son and Holy Spirit in us because we are "in Him" as His Body. When Jesus ascended to the Father, those who love and follow Him became His flesh body. He works through those who love and serve Him. We are His flesh now. God has poured out His love upon us through His precious Son Jesus. Before we were even born or had a chance to say “I'm sorry,” God sent His Son to die for our sins to show His love for humanity who were originally created in God's image and likeness. “For God so loved the world that He gave His one and only Son, that whoever believes in Him shall not perish but have eternal life.” John 3:16 Jesus loved us first. Love emanates from God!" We love because He first loved us. "1 John 4:16 Out of the love of Our Heavenly Father, Jesus came to lay down His life for sinners so we could be restored to the Father for all eternity. Jesus said, “Greater love has no man than this, that He lay down His life for His friends. You are My friends if you do what I command.” John 15:13 Jesus not only said this, He showed the greatness of His and the Father's love by laying down His fleshly life on the cross. The Apostle Paul understood Jesus' love for him. Galatians 2:20: The life I live in the body, I live by faith in the Son of God, who loved me and gave himself for me.” It was God's grace and love for mankind that moved Him to send His Son to save the world by His shed blood. Grace is God's love, goodness and favor extended to sinners through no merit of our own but because of the finished work of His own precious and beloved Son. When we are "in Christ," God's unmerited favor is upon us solely because of Jesus' perfect sacrifice for the sin of the whole world. All one must do is accept His grace and truth through His Son. A person can set aside God's grace. Paul understood this too. He said,“I do not set aside the grace of God, for if righteousness could be gained through the law, Christ died for nothing.” Galatians 2:21 In other words, if God's grace and love could be gained by obeying the Law, then Christ died in vain. There is nothing -- no ritual, no works, no merit of our own-- that can save us. Only the sacrifice of the Perfect Man and Perfect God -- Jesus -- can do so. 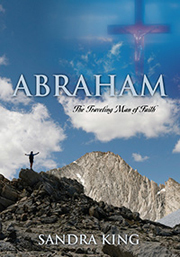 The first Man -- Adam -- was holy and perfect when the Godhead lovingly shaped and formed him and breathed the breath of life into him making him a living being. Adam and the Woman's sin had to be atoned for by a Perfect Man--Jesus--who was also fully God. There was no doubt in John's mind that Jesus loved him. He knew that Jesus loved him just as he was, right where he was at. Jesus called John to follow Him when John didn't know Him and he was full of sin. But John began to really know Jesus as he walked with Him and talked with Him. He also learned about Jesus through Jesus' life example. The Holy Spirit had taught John that in order to draw close to One who is holy, he must allow Jesus and His Holy Spirit to walk him into holiness also step by step. As the Holy Spirit removed more and more of John's fleshly, sinful ways, the more He reflected the righteousness of Jesus whom He loved, and the closer and more intimate their relationship became. Love must be returned to be complete. Jesus' love is a royal love--a high, holy love. Jesus gave His life and love willingly for sinful humanity. We don't have to earn it. If we did, it wouldn't be love. Love must be given away, not earned. Jesus wants us to also love Him willingly and freely from our hearts. He says three times in John 14 that the way we show Him that we love Him is by willingly obeying His Word out of our love for Him. Love on the part of both parties is the basis of any relationship. Without love, there is no relationship. So willing love is the key. God and others are to be the objects of our love. Jesus said the most important commandment is this: “Love the Lord your God with all your heart and with all your soul and with all your mind and with all your strength.” The second is this: “Love your neighbor as yourself. There is no commandment greater than these.” Mark 12:30-31 God wants us to learn how to love with His love which is higher and deeper than our human love. Jesus wants us to imitate Him and His love as He imitated the Father's love.“As the Father has loved Me,” so have I loved you. Now remain in My love. If you obey My commands, you will remain in My love, just as I have obeyed My Father's commands and remain in His love.” John 15:9-10 Jesus tells us to remain in Him and in His love. How? Jesus gives us the answer in John's Gospel. a) “If you remain in Me, and My Words remain in you, ask whatever you wish, and it will be given you. This is to My Father's glory, that you bear much fruit, showing yourselves to be My disciples.” 15:7 The Word of God remains in us when we do it. "We know that we have come to know Him if we obey His commands. 1 John 2:3 If we ignore the Word or cast it aside, it does not remain in us. It is in the doing of the Word that it abides in us and we bring glory to the Father. Since Jesus is the Living Word, when His Word abides in us He abides in us in greater measure. As we keep the Word of God in our hearts and let it guide our actions, Jesus and His ways will be established in us. We must yield to the Holy Spirit and the Truth and resist sin. We worship Him when we walk in Spirit and in Truth. Jesus said in John 4:23-24, "Yet a time is coming and has now come when the true worshipers will worship the Father in spirit and in truth, for they are the kind of worshipers the Father seeks. God is Spirit, and His worshipers must worship in Spirit and in Truth." Jesus is Truth and the Holy Spirit is the Spirit of Truth. Christ's life flows through His disciples when they remain in Christ. If we fail to do this, we will be fruitless and of little worth to His Kingdom. In Luke, Jesus tells us what he or she is like if His Word is put to practice in their life. Jesus said,"Why do you call me, 'Lord, Lord' and do not do what I say?" I will show you what he is like who comes to Me and hears My words and puts them into practice. He is like a man building a house, who dug down deep and laid the foundation on rock. When a flood came, the torrent struck that house but could not shake it, because it was well built. But the one who hears My words and does not put them into practice is like a man who built a house on the ground without a foundation. The moment the torrent struck that house, it collapsed and its destruction was complete. Luke 6:46-49 When we are established in Jesus by obeying Him, our house is solid. When a storm comes, we don't collapse but have a deep foundation in the Rock Jesus and will not be shaken because our house is well built. The storms of life strike every person, but when we are solidly rooted and grounded in God's Word, we can withstand any storm until we reach the other side of it. b) “As the Father has loved me,” so have I loved you. Now remain in My love. If you obey My commands, you will remain in My love, just as I have obeyed My Father's commands and remain in His love.” John 15:9-10 We remain in Christ's love by developing spiritual intimacy and communion with Him through obeying His Word just as He did with the Father. Jesus and the Father were so connected in love, actions, words and deeds, that they were as One. How do we know that we are "in Him?" 1 John 2:6: "Whoever claims to live in Him must walk as Jesus did." The truth was seen in Jesus.. The truth must also be seen in believers. If we are to have an effect on the world and others to bring them to Jesus, we must allow the power of Jesus and the Holy Spirit to help us walk as Jesus walked. 2 Peter 1:3-4: His divine power has given us everything we need for life and godliness through our knowledge of Him who called us by His own glory and goodness. Through these He has given us His very great and precious promises, so that through them you may participate in the divine nature and escape the corruption in the world caused by evil desires. God's grace and mercy must not be used as an excuse to enter or remain in sinful behavior. It is important to understand that spiritual maturity doesn't happen overnight. We don't go from a babe in Christ to a full-grown spiritually mature man or woman of God instantly. It is a progressive process that takes place when we are willing to hear the Word and allow the Holy Spirit to help us do the Word. It is in the doing that the Word/Jesus abides in us. We must be patient with ourselves and with others as we attempt to progress in our walk with the Lord. As God is patient, kind and long-suffering with us, we must be patient, kind and long-suffering with ourselves and others as we spiritually grow and mature. The Godhead is steadfast in mercy, grace and kindness as we are learning and growing. David, the “man after God's own heart,” wrote about hiding the Lord's Word in his heart in Psalm 40. “I desire to do your will, O My God; your law (Word) is within my heart.” v8 He went on to say that he proclaimed righteousness to the people. He also didn't hide God's righteousness in his own heart from them, or God's love and truth. v10 David was not ashamed of his relationship and his knowledge of God and His Truth. “May your love and your truth always protect me.” v 11 David knew that God's love and His Truth would always protect Him. We are protected when we are within the boundaries of God's truth. We must learn to love God's Truth if we are to spiritually grow in our relationship with Jesus and the Father and with others.